05/18/2011 11:36 AM - DES MOINES, Iowa - The Arena Football league today announced that former Iowa Barnstormers Quarterback and NFL great will be returning to Des Moines, Friday May 27. Warner will be in town to broadcast the Barnstormers home game versus the Utah Blaze to a nationwide audience on the NFL Network. he will provide Color Commentary on a Broadcast team that will also include former Iowa Hawkeye Paul Burmeister (play-by-play) and Anthony Herron (sideline reporter). Kick-off is set for 7:05 p.m. at Wellmark Field at Wells Fargo Arena. The game is key for both teams as they try to re-establish themselves as playoff contenders. Warner, a native of Cedar Rapids and graduate of the University of Northern Iowa, put the Iowa Barnstormers on the map as the all-AFL Quarterback and led the team to back-to-back Arena Bowl appearances in the 1996 and 1997 seasons. His final game as a 'Stormer was an Arena Bowl XI loss at Arizona. Warner then went to lead the St. Louis Rams to victory in Super Bowl XXXIV, where he was named the game's MVP. Warner was named NFL MVP in the 1999 and 2001 seasons. Warner returned to Des Moines last seas as he was named as the inaugural member of the Iowa Barnstormers Hall of Fame, on May 21, 2010. Next Friday's game vs. Utah is presented by Toyota of Des Moines. Come "Kick-off the Summer" with the Barnstormers. As part of the festivities, hot dogs will be available all night long for just $1.00. Tickets remain on sale now for as low as $15.00 per seat. Students can receive buy 1 get 1 free tickets by showing a valid student ID at the box office. 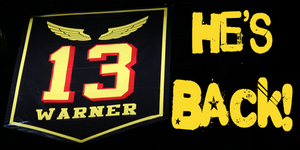 For more information or to order tickets, please call the Barnstormers at (515)-633-2255 or log onto www.theiowabarnstormers.com.